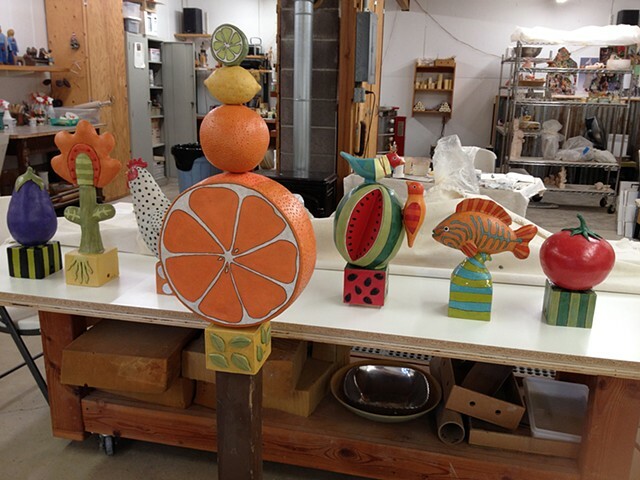 In 2015 New Seasons Market commissioned me to make a series of 7 post toppers for the outdoor patio in their new Woodstock store. Here they are in my studio prior to installation. Dave Gonzales welded post sleeves with rods to my specifications that are used in the citrus and watermelon toppers. Thanks to Dave for great, accurate work. Thanks to New Seasons Market--it was such a pleasure to work with you!